How are you doing on the execution of this year's digital roadmap? Are you already seeing changes that impact previously prioritized features and functionality? Well, you’re not alone. Many companies are in the same place as you; having to sacrifice some key marketing insights needs that will help you understand your customer, optimize marketing spend, and drive an effective acquisition and retention strategy. If your company is new to concepts like SEO and SEM, you most likely are seeing that your “projects” are getting cut or delayed; making it nearly impossible to transition to new data driven Customer Experiences. How can you better integrate content marketing and advertising with customer data or IT? What’s an appropriate budget for your activities? How long will it take to implement and what’s the priority? These are common questions that we see with our clients. And if your team is communicating the digital story across your company in 2018, you could probably use some help. In a few short years, digital marketing planning has transformed from an annual one-week-long effort led by one individual to a full-on Model UN-style negotiation period across multiple teams to ensure there’s a shared vision in the organization. As marketing and sales continue to share data points that clarify customer intent; these teams must work more closely than ever before. Just choosing tools is a giant undertaking and only half the battle; defining a winning strategy with the right tactics, goals, and channel strategy completes the digital marketing landscape. 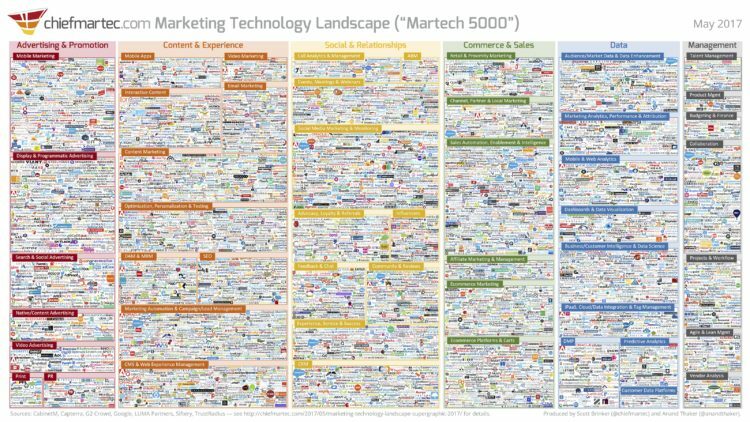 Earlier in my digital career, the MarTech map, created by chiefmartec.com listed about 100 companies. Today it shows more than 5000 companies that support digital efforts like UX testing, ecommerce, digital advertising, and data collection. Creating a digital marketing plan is overwhelming in 2018. And success lies in narrowing the many options down to the key tactics that will drive value for your digital marketing team. A company can’t do awesome paid search remarketing if its data policies need work, nor can it effectively drive SEO engagement without the aid of talented developers and content producers. Effective, customer-centric digital marketing requires active involvement from many stakeholders across the company. The most effective way to create these synergies and create a shared vision is to host a Digital Strategy Session. In fact, many of my most successful clients have attended a Digital Strategy Session, or what I might sometimes refer to as an Intervention. It’s easy to dismiss a written recommendation from an outside consultantancy, but a strategic off-site where executive leadership becomes aligned creates lasting change. These strategy sessions are not just for large companies. Companies of all sizes can benefit from this activity whether they are robust small businesses with 45 employees or international corporations with disparate teams in far-flung locales. We have personally seen the benefit to groups that work with a consultant on a strategy session; executives have that epiphany that many teams have been hoping for but haven’t achieved. Marketing, sales, and IT teams reach a new understanding about how they influence each others destiny. Stakeholders leave with a clear plan for the future! Leave the distractions and politics at the office by getting offsite. You don’t have to go to Disney World (It’s a Small World is actually a great ride to make sure you get a CIO’s attention), but a change in environment is key. Make no mistake, I’m not describing a wilderness retreat with trust falls and macramé, just a change of locale. Even a meeting at a conference center across town can put stakeholders at ease and provide a disconnect from phones, emails, and the demands of a workday. It would be great if you’d visit us at our Pittsburgh or Chicago offices. We love hosting Strategy Sessions. You can narrow a Digital Strategy Session’s focus to a few key topics, you’ll be much more successful in achieving the desired outcomes. Grandstanding and meandering have no place here. Sure, Ted in Finance is going to bring up the supply chain issue in South Asia, but an agenda helps the group move past that and stay focused on something like integrating social reporting with revenue analysis. Agendas for strategy days really function as a contract. Everyone agrees to it ahead of time, and no one is offended when it’s time to move on. Not sure where to begin? Here, I’ve got a sample to get you started. Discuss Search gaps – Not ranking for key terms? Role of paid search – Opening or closing leads? Where is budget best spent? Solidify Omni-Channel Funnel Strategy – Does it all work together for great results? Codify Content Promotion playbook – Don’t just hit publish. Support your content with promotion. Discuss Attribution – Are paid campaigns and organic leads credited the whole way through the sales cycle? Pitch data integration projects & tools – Use customer trends for remarketing or AdWords email customer match. Review Google Analytics tracking for marketing needs – Could your group get more out of the data layer? Reporting Challenges – Are metrics shared across the org? What are your key KPI’s? Data Studio can help. Digital Strategy Sessions aren’t presentations or one-way discussions. Collaboration is key. A strategy day is the time to find out what teams know and to learn what they don’t. Gaps in understanding surface during these conversations, as does alignment across executive leadership. “I wanted them to engage, to hash things out at the table, rather than show a bunch of slides. There should whiteboarding and working together, there should be strategy and sandwiches. Of course, historical data will be beneficial to inform your strategy and set your benchmarks, but make sure you’re working together towards the shared vision. Keep things moving towards a desired outcome with an expert adviser. Look for someone with years of industry experience and conflict management skills. This puts stakeholder attendees on equal footing and the Social team can’t gang up against Debbie who manages the CMS. This way you won’t recreate roadblocks that spring up during your office meeting. An expert adviser will move the group in unison and navigate these minefields. 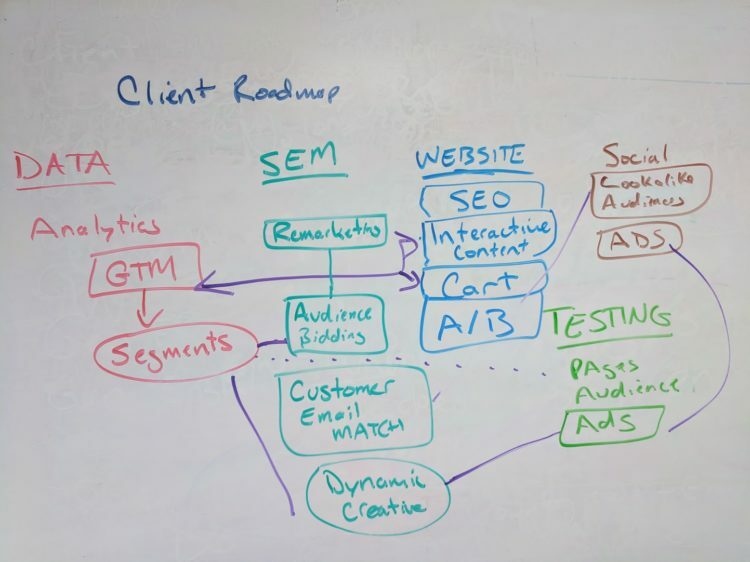 After analysis, an expert can present a framework to work through major digital marketing issues. Maybe your group is spending too much time “litigating” a strategic point unlikely to yield results? How important is email to your business? Are you missing out on key on-page SEO techniques, or do you have a roadblock in your data flow between advertising and reporting? What is the lifetime customer value of a user? An expert adviser is also a consultant and can play the part of a mediator, to navigate teams to positive solutions to these issues. It may be the case that current data collection isn’t sufficient to really power a great SEM campaign. Don’t spin your wheels, find out from an expert. Uncover interdependencies between teams and realign to create a shared vision. You don’t have to hire expensive management consulting to achieve great results. When it comes to the vast marketplace of tools, make sure your adviser is an expert educator as well. Everyone on the LunaMetrics Digital Strategy team is an expert trainer and teaches small, medium, and enterprise businesses how to use digital marketing tool suites. Too often it can be hard to get everyone in a room together. Schedules conflict, meetings overlap, fires need to be put out and cats herded. For a Digital Strategy Session to be meaningful and successful, you need to have the key decision makers in the room, cell phones and smart watches put away, and intense focus on the day. Bringing in the Adviser can help with this, making sure everyone is staying on task and keeping the conversation focused at a level that everyone is getting value of the session. The most successful digital strategy sessions combine Data-driven recommendations with actionable team-based strategies to achieve a positive outcome. Go beyond a standard SEO/SEM audit and fix the underlying issues to allow everyone to take credit for the successes. Ditching a channel-mentality often leads to a breakthrough during these sessions. We’ll design the sessions as a collaborate roadmap to fill in key agreed upon future initiatives. This is a great time to talk with your expert adviser about feasibility and priorities. Should a new website happen before a big ad spend? This is the time to hash it out. End your session with my favorite part of any Strategy Day, the “CTRL-P” moment, the part where you print your strategy and share with everyone. When your session ends, stakeholders leave with strategic alignment and an executable roadmap; complete with action items and timelines across each discipline.